The Upper Mustang trek brings you into the hidden world of the old buddhist kingdom of Mustang, also called Lo. Lo used to be part of the Tibetan empire, and is therefore closely related to Tibet. Tibetan Buddhism is still being practiced in a very pure form and villages are built in Tibetan style, with white washed houses with firewood tucked on the roofs. Not only the culture, also the landscape is very much related to Tibet. Mustang lies in the rain shadow of the Dhaulagiri and you walk in a complete desolate landscape, surrounded by rocks in all kind of colors and bizarre formations. It is unique to trek in summer seasons. In this barren landscape the villages with their bright colored fields are like oases . 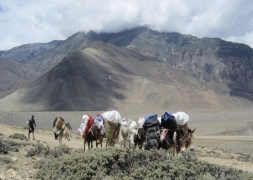 The trail follows the salt caravan route of the old days, during which the people of Mustang traded Tibetan salt with grain from the lowlands. 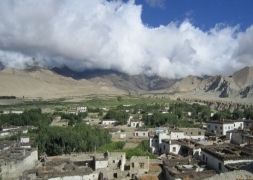 The goal of the Upper Mustang trek is the capital of Upper Mustang, Lo Mangtang. Lo Mangtang is a medieval town, surrounded by a huge town wall. From the pass Lo La (3950 m) you can see the town shimmering in the distance in the barren landscape. While entering Lo Manttang through the town gate you enter a different world. It is just wonderful to wander through the narrow alleys. On several corners of the street you can find small groups of women spinning wool and discussing the news of the day. At the end of the afternoon big herds of goats are being let through the city gate and through the narrow alleys, back to their sheds, which are inside the town. In Lo Mantang you can find the palace of the king, a huge 4 level high building. When the king is at home, you can even pay him a visit sometimes. The king doesn’t have any real power anymore, but is of course still highly respected by his people. Besides, there are a few beautiful big monasteries, for example the Thugchen Gompa, built in the 15th century. Day 01 - Arrival in Kathmandu (4,430ft). Day 02 - Sightseeing in Kathmandu (4,430ft). Day 01 – Arrival in Kathmandu (4,430ft). Upon your arrival at Tribhuvan International Airport (TIA) in Kathmandu, a representative of our organisation picks you up and transfers you to the hotel. Today you have a welcome dinner and can try authentic Nepali food like Dal Bhaat, what Nepali people eat 2 times a day. You also get to know your guides who provide you a detailed briefing on your upcoming trek so that you are well prepared for the trip and any last-minute question will be answered. Today you visit the most important sightseeing locations of Kathmandu. After breakfeast you drive to Swayambunath, the "Monkey Temple" of Kathmandu, a buddhist pilgrimage place with a small stupa. After that you visit Kathmandu Durbar Square with its pagodes, the home of the living goddess Kumari. Today we will drive about 6 to 7 hours from Kathmandu to Pokhara. On the way we will see several mountains, the typical rice terrasses of Nepal and the people working on the field. We will eat lunch on the way. Pokhara is famous for its location next to Phewa Lake and the fantastic views of Manaslu and other mountains. After having some free time in the hotel we can go shopping at the lakeside with its numerous small shops, or make a boatstrip. In the evening we have time to prepare for the trek. An early morning scenic flight takes us to Jomsom (25 minutes) where we have breakfast and meet up with our crew After a brief introduction and a quick sorting of our daypack and the main bags, we start our trek. The trek heads into the Kali Gandaki Valley, following the Kali Gandaki River most of the time. Today we will hike a long time on newly built secondary road. The day ends at Kagbeni, one of the big settlements of the region. The restricted area starts after the village of Kagbeni. Heading north along the river, the snowy Nilgiri (22,431 feet) will dominate the skyline in sharp contrast to the river canyon below. Then we enter Tange village, a labyrinth of narrow alleys among whitewashed houses with fields of buckwheat, barley, wheat, and apple trees. Then we continue toward Chhuksang along a trail lined with chortens (Buddhist wayside shrines) painted the traditional colors of red, black, and white -- colors made from local rocks and minerals. Eventually cross the Kali Gandaki River on a steel footbridge, then climb up to the village of Chele, perched on a ridge above the gorge. Today will begin with an unrelenting climb -- the trail often hewn out of the canyon wall -- continuing more gently to your lunch stop at the pleasant village of Samar. In the afternoon, navigate over two more ridges (highest pass is about 12,500 feet) to Syangbochen a small cliff-side settlement with a panoramic view of the Annapurnas. We start uphill to another pass of about 12,500 feet. The trail then descends with two drops into small canyons, and then continues with a gentle ascent toward Chyunkar and the Nye La (12,720 feet). From this pass, you'll have incredible views of the Annapurnas and Nilgiris as well as sweeping views of Mustang. Ghemi Village, built on the edge of a steep cliff, appears in the distance. Visit the 13th century gompa here. We descend to the tributary of the Kali Gandaki and cross it on a steel footbridge. On the opposite side you will find the longest mani wall (tens of thousands of rocks carved with sacred prayers) in Nepal. Then we follow an alternate trail to two interesting villages, Tramar and Lo Gekhar. Lo Gekhar contains one of the oldest gompas in Nepal (built in the eighth century -- even older than Samye in Tibet), a great red-and-white structure surrounded by trees. At Marang turn to follow the drainage to Tsarang, the impressive village that contains a huge five-story white dzong (fortress) as well as the imposing red gompa, Dorje Dhen. Today, we trek to Lo-Manthang with a magnificent view of Nilgiri, Tilicho, Annapurna I and Bhrikuti peak. The trail first descends to Charang Chu Canyon and then climbs steeply after crossing the river. Further the trail ascends gently to the 3,850m windy pass of Lo, from where you can see the Lo-Manthang Valley. While descending to Lo-Mangthang, views of the walled city appear magnificent with its hills on the Tibetan Border. Today we will stay in Lo-Manthang. We have time to explore the maze of narrow streets winding through approximately 150 houses, and three important gompas built in the early 15th century. These temples (along with those in Tsarang and Lo Gekhar) have been rescued from the ravages of time by the efforts and heart of local people (Lo Gyalpo Jigme Foundation in collaboration with the American Himalayan Foundation) -- with stunning results. If you are very fortunate we may get an audience with the king or queen at the four-story palace. The king, Raja Jigme Parbal Bista, although his duties are mostly ceremonial, is well loved and respected throughout the region. Our route south is unusual; most groups return the same way they came, but we will make a loop following remote trails on the east side of the Kali Gandaki. Back over the Lo La, head southeast to the Tholung Valley, with terrific views of Nilgiri as we climb higher. Tsarang will come into view across the way, and finally descend steeply into the bowels of the canyon to the village of Dri, one of the most prosperous villages in Mustang. It is a whole day's trip to Luri Gompa and back via Yara and Ghara villages. The landscape here contains strange, fluted pinnacles eroded by wind. At 13,500 feet, Luri sits like an eagle's nest in the cliffs. This mysterious cave monastery dates from the 13th century. The central chamber is carved directly into the rock. The domed ceiling is covered with murals, and in the center of the chamber there is a large and finely crafted chorten. Luri is a true jewel in a most unbelievable setting -- the artwork here is considered to be some the finest and most unusual in the Himalayas. The trail follows the river for a while, and we'll negotiate five or six fairly shallow crossings of tributary streams (wading shoes will be necessary). This is a very good time to look for spiral fossils (saligrams) scattered among the rocks along the shore. Then we cross the river that is coming down from the sacred lakes of Damodar Kunda, and then over desolate terrain up to a pass of 12,600 feet. This is a long day, but finally the fields of the prosperous village of Tangye will appear below, and we'll arrive at camp after passing a series of large chortens. Today it goes up and down in lower elevations until we reach Tetang. It will take about five hours to reach the pass, Gnyu La, at 13,000 feet. It is a rewarding route providing fine views the entire way and wild flowers. From the pass one can see Muktinath, and within a few hours we will arrive at the final stretch where the trail goes through a grove of trees, across a bridge, past a nunnery, and finally joins the main trail from Manang. Here officially exit the restricted area of Upper Mustang. Muktinath is a holy place, the destination of thousands of Hindu and Buddhist pilgrims every year. We'll have time to visit the many fine temples and shrines. On the last day of trek you'll be on the main Annapurna circuit route. Enter the village of Jharkot and visit the monastery and the traditional Tibetan medicinal center. Heading west to the Kali Gandaki, we'll pass Eklobatti, then south along the river to Jomsom. While still beautiful, Jomsom will be quite a culture shock compared to where we have been with all its busy activity -- perhaps including a newly arrived highway (which may even have some internal combustion vehicles plying the gravel and spewing exhaust). This scenic flight from Jomsom takes about 30 minutes to Pokhara. After having some rest at your hotel in Pokhara, you can go to the other side of the lake by boat and hike about 200 meter up to World Peace Pagoda. The path leads through shady forest and offers great views of Phewa Lake and Pokhara down and the mountains in front of you. Today we fly back to Kathmandu and from there drive further to the old kingdom Bhaktapur. There you have time to relax and recover from the long trek. If you want you can explore Bhaktapur yourself. Hotel in Kathmandu: 2 nights: 3 star standard hHotel with bed and breakfast. Hotel in Pokhara: 2 nights: 3 star standard hotel with bed and breakfast. The Upper Mustang Trek is a great alternative for travelers who want to experience real Tibetan culture as it was in the past. The Loba (Lo Pa) people are ethnic Tibetan and practice a form of Buddhism from the Sakya lineage. There is also a sect of the rare Bon religion here. The Bon priests practice along with Tibetan lamas at local festival. For those who are interested in religion, anthropology, Asian studies, mythology, art or antiquity this is a great field study.